Chicory, Cichorium intybus, is also known as Succory. Chicory is an exceptionally useful culinary and medicinal plant. The tap root penetrates deep into soil, breaks up clay and mines minerals from sub-soil. Sometimes used as an animal fodder, being rich in nitrogen, potassium, sulphur, silica and vitamins. Leaves are used raw in salads, cooked as a vegetable and infused as a tea. Chicory was probably one of the original bitter herbs used to celebrate the Jewish Passover. The root may be roasted and used as a coffee substitute. Chicory is an aid to digestion and helps to maintain kidney and liver function. Chicory is a native of Northern Hemisphere and prefers gravely or chalky soils in an open, sunny position. Pretty blue flowers in summer. Drought and frost resistant. A perennial plant, it growing to 1m x 0.7m. 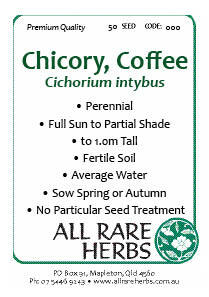 Be the first to review “Chicory, Coffee seed” Click here to cancel reply.